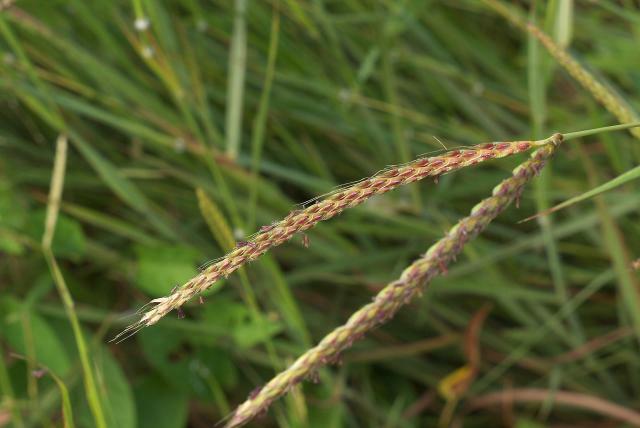 The name Centipede grass is also used for Eremochloa ophiuroides, a grass species generally used for lawns. Centipede grass (Ischaemum timorense Kunth) is an annual or perennial spreading stoloniferous grass, rooting from the basal nodes. Culms are erect, up to 1 m high. Its hairy leaf blades are 3-6 cm long x 3-15 mm broad. Inflorescence is terminal, with 2-3 opposed racemes, each bearing pairs of 4-7 mm long spikelets. Centipede grass is a fodder species of minor importance in Asia. It is used in permanent pastures and can withstand heavy grazing. While it is more rarely harvested by cutting, it gives a good quality fresh fodder and hay. Centipede grass is also a good ground cover and fresh and dry foliage can be used for composting and mulching (Ecocrop, 2010; FAO, 2010). Centipede grass is native to tropical and temperate Asia and is naturalized in Central and South America. It is found from sea level up to an altitude of 2000 m. It generally occurs in disturbed areas (roadsides, banks or terraces, forest margins, etc.) and also in rice fields (Cook et al., 2005; Ipor et al., 1992). It does not tolerate frost and grows best with an annual rainfall between 800 mm and 2000 mm, on well-drained, light- to medium-textured and low-fertility soils with a pH ranging from 4.5 to 5.5. Centipede grass can withstand dry periods but may become an annual in such conditions. It can grow in shaded areas (up to 50% shade) and is used as ground cover under trees. It may also withstand high soil acidity. However, centipede grass is not tolerant of poor drainage and waterlogged conditions (Ecocrop, 2010; FAO, 2010; Cook et al., 2005). It yields up to 30 t fresh forage/ha/year but the dry matter yield is too low to warrant cultivation (FAO, 2010; Cook et al., 2005). Centipede grass may become a weed in annual crops as it establishes readily, spreads through rooted stolons and is tolerant of shade and short droughts. 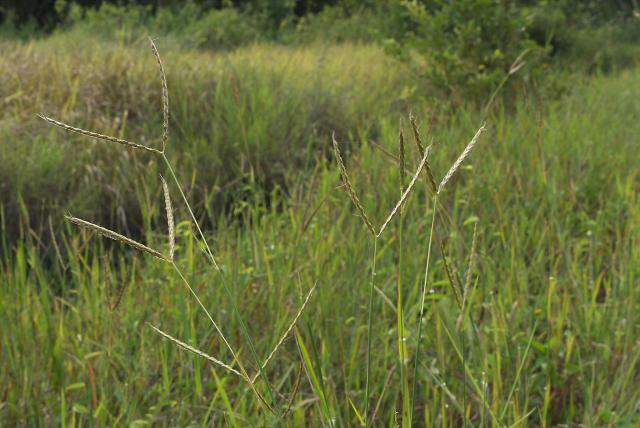 In Indonesia, it is a common weed of rice (Ipor et al., 1992). It does not require added fertilizers and it can resist fires because it regrows from the stolons and seeds. It is listed as an "environmental invasive species" by the PIER (Pacific Islands Ecosystems at Risk) (Cook et al., 2005). There is no record of toxicity from centipede grass (Cook et al., 2005). Centipede grass is palatable and well grazed by cattle, horses and sheep. It is an important component of the Nakhon Si Thammarat pastures, a province of Thailand (Chauychuwong et al., 2012). However, production per head is usually limited by excessive stocking rates. Centipede grass presents good quality leaf material but may be restricted by very low soil fertility and limited bulk (Cook et al., 2005). Crude protein content decreases with age, from 11% to 5% DM between three and eight weeks (Appelman et al., 1962).